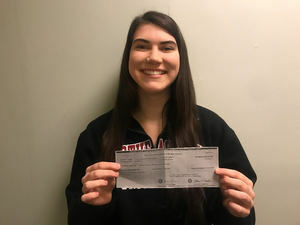 Concert Happenings in Ridgefield's Park (CHIRP) is pleased to announce that as a result of the dedicated work of last summer's intern, Abby Fennell, (RHS 18), now a freshman at Northeastern University in Boston, the series has been awarded a $15,000 grant from the Connecticut office of Economic & Community Development. The grant is to be used to assist with artist fees and other operating expenses for the 2019 summer series. The series which has been co-sponsored since its inception by the Ridgefield Press and the Ridgefield Parks and Recreation Dep't was begun in the aftermath of 9/11 to bring the community together. According to CHIRP Producer and Ridgefield Selectwoman, Barbara Manners, the grant was a direct result of Abby's work. "While I put the finishing touches on the grant application, CHIRP would never have even begun the application process without the resources Ms Fennell brought to her internship. She is organized, an excellent writer and sees her projects through." Ms. Manners said she was hoping to again have an intern assigned to her from the High School in the spring semester. "Abby was the first intern CHIRP has had and she enabled us to get multiple tasks accomplished that we didn't have the resources for before this." Ms. Manners is currently in the process of booking the coming season's concerts and says the grant has already been helpful in being able to secure the performance of a number of groups who were out of our reach previously or whose popularity since CHIRP first presented them now mandates a considerably higher fee. CHIRP's 2019 season (its 18th) will open Tues. May 28 with British roots/rocker James Maddock whose first CHIRP performance in 2018 garnered the audience's rave reviews. It continues Tues. June 4, with the awesome and multi-award winning Texas singer/songwriter Hayes Carll making his first CHIRP appearance. Check out CHIRP's facebook page CHIRPCT for future updates to the schedule.